Wikidata is a free and open knowledge database that can be read and edited by both humans and machines. 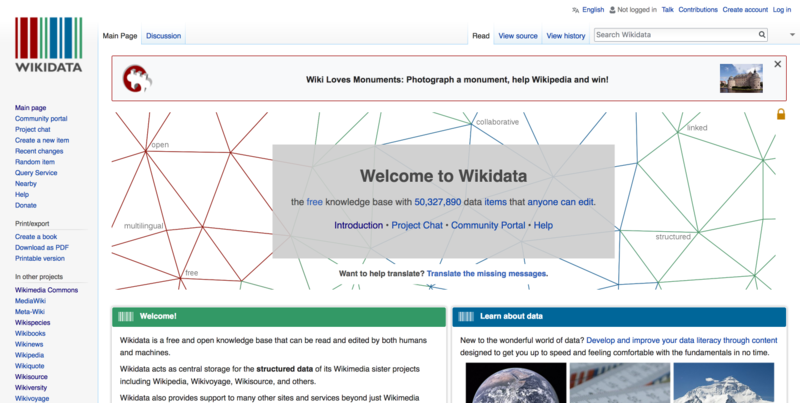 It not only acts as a repository for structured data used by other Wikimedia projects, such as Wikipedia, but its content is available under a free licence for use by anybody without restriction. It currently contains over 50 million data items. The workshop will introduce you to using and editing Wikidata, explaining statements, properties and qualifiers. It will provide hands-on experience of editing entries and of using SPARQL queries to retrieve information. Doug Taylor is a retired educator and IT professional. He is a long-term Wikipedia editor and writes code to import Wikidata into the Wikipedia projects. He has a volunteer role as Lead Trainer for Wikimedia UK. Doug is also a Trustee of Wikimedia UK and Secretary of WikiProject Med Foundation. Doug’s interests include scuba diving and he has been a CMAS 4* Diver and National Instructor for over 25 years. This work by Doug Taylor is licensed under a Creative Commons Attribution 4.0 International License.